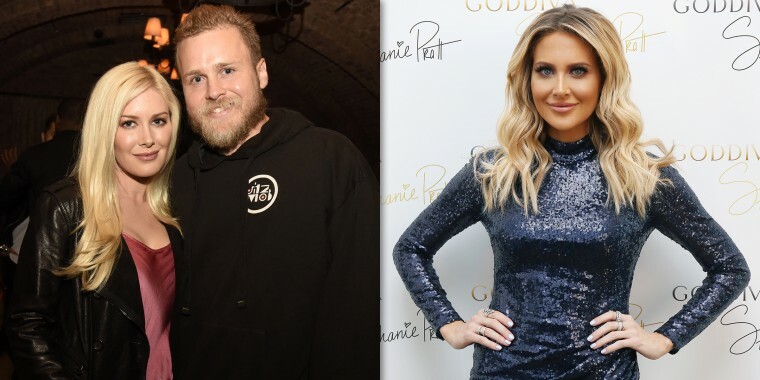 "The Hills: New Beginnings" hasn't even aired yet, and there's already a new feud between cast members that goes way beyond the show. "The Hills" are alive with drama once again. Frenemies, feuds and blowups were all part of the action on the original MTV reality show, and now, just months before a sequel series debuts, there's already a divide between cast members — who happen to be family members, too. On Monday, "The Hills: New Beginnings" star Stephanie Pratt revealed that she's no longer on speaking terms with brother Spencer Pratt and his wife, Heidi Montag. In fact, on her "Pratt Cast" podcast, she said she doesn't even "consider them (her) family" anymore. "We're not on speaking terms," Stephanie said. And when her co-host, "Bachelor in Paradise" star Wells Adams, asked why, her answer was simply, "Heidi." And now Heidi has something to say about that. Without mentioning Stephanie by name, she continued, stating that she and the "family member" were at an impasse after the dust-up. "The next day I was just like, 'Hey, yeah, let’s give it some time and I’d love to move forward.' Then the person didn’t even message me and was, like, subtweeting me. So, it was like, 'You obviously don’t want to make amends.'" As for Spencer, he said, “If you think you’re going to walk on my sweet little angel, Heidi, you have something coming your way." Still, the question remains: Why all the bad blood? Well, Stephanie offered up a bit of a rundown on her podcast. "We had our photo shoots for press and for the opening titles, and we had three days of it that went to 3 a.m.," she recalled "They were long shoots. And Heidi had a bottle of champagne that she gave all the girls except for me." Stephanie added that Heidi "would just blank me" throughout the experience. Viewers will have to tune in to the "The Hills: New Beginnings" in June to get all the details and find out just how it all blew up, but Stephanie didn't hold back when it came to dishing about the aftermath. "Heidi is always number one to Spencer, so you know what? Spencer is dead to me," she said. "That’s the only way I can handle it is knowing that he died." Of course, the feud itself should come as no surprise to "Hills" fans who witnessed the family fracture on the first series. But when the new show starting filming, it seemed it was all in the past — at least at first. “It’s so funny because the original ‘Hills’ broke us up, and now the new ‘Hills’ has totally brought us together — geographically and emotionally, and physically," Stephanie told reporters at the time. Alas, "New Beginnings" made for a nasty ending for them.